Various types of surface aeratiors have been the latest effort in this ongoing challenge. But, the more aeration and mixing that is used, the more that seems to be needed – and the more electricity is required in rural communities that have high energy costs to begin with. Eventually, the ultimate requirement is expensive dredging, vacuuming or rebuilding of the lagoon system – only to go back to the old ways of attempting to keep the water pollution at bay. In the very advanced ‘activated sludge plants’ used for cleaning wastewater in large cities, there is a specific part of the process that is especially effective in reducing the organic matter in that wastewater. It is the secondary clarifier within the process. This clarifier holds sludge that is being digested by the indigenous bacteria that entered the plant with the wastewater. The digestion process is assisted with slow moving “rakes” that continually, slowly, mix the sludge, making it readily available to the bacteria. Eliminates the organic solids in the sludge completely through microbial digestion. Provides enough dissolved oxygen to keep the entire microbial population alive and thriving. Oxidizes, through continual vertical mixing, all of the trapped waste gases (nitrogen, ammonia and H2S) in the water column and sludge, thereby cleaning the water. Eliminates all odors in the body of water. Eliminates stratification and seasonal turnover throughout the entire body of water. 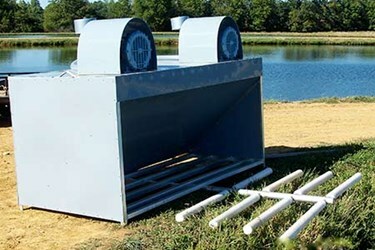 Reduces the sludge buildup to the point that pond/lagoon dredging is set back indefinitely.